There are a great many reasons to go to Vegas. For many, the draw of course is the gambling and the nightlife. For others, it’s the shows, the rides, and the stunning lights. In short, everything in Vegas is turned up to eleven and is worth writing home about. And that’s true of the amazing pools too! 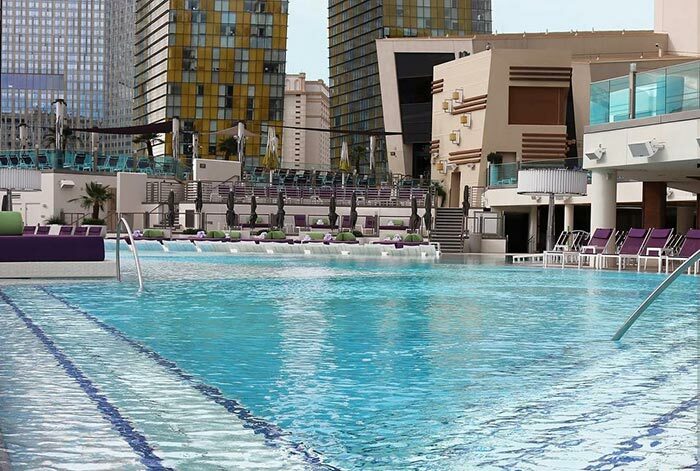 Here we will take a look at some of the best pools in Vegas. 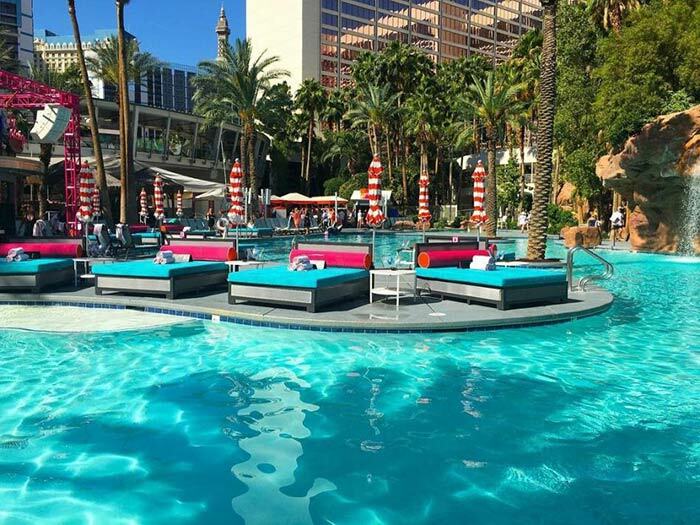 If you are looking for more of a party pool, check out the best vegas pool parties, as the ones below are the normal resort pools and not day clubs. 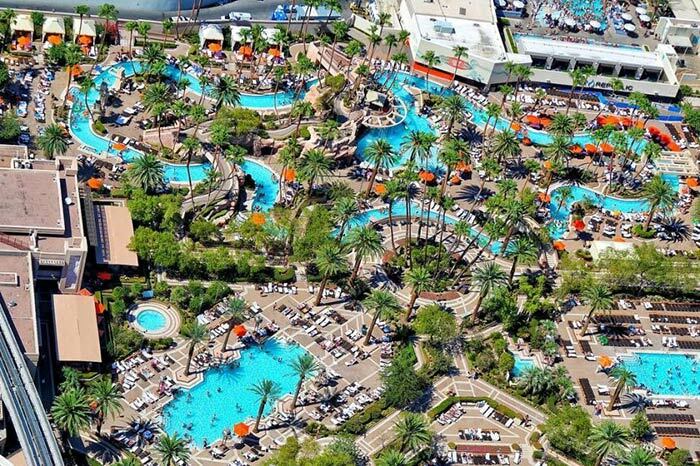 MGM Grand Pool and Lazy River, Photo Credit MGM Grand Instagram. This is not just a pool but a ‘grand pool complex’ that offers 6.5 acres of relaxation. What did we tell you? Vegas does not do things by half! That includes a total of four different swimming pools, three whirlpools, a bunch of beautiful waterfalls, some lazy river stretches, and more. Whatever you enjoying doing in the pool, you’ll be able to find a spot here to enjoy, and you’ll find stunning views and tons to do at every turn. The Grand Pool complex at MGM Grand offers one of the most elegant swimming experiences with celebrities known to frequent this massive 27,000 square feet area filled with five swimming pools, three large whirlpools, a lazy river and more all set in an especially lush and tropical landscape. Families especially enjoy the 1,000-feet long river – fun for the kids as well as young adults who often use it as the perfect place to mingle or to coast along with a drink-in-hand and no worries at all. 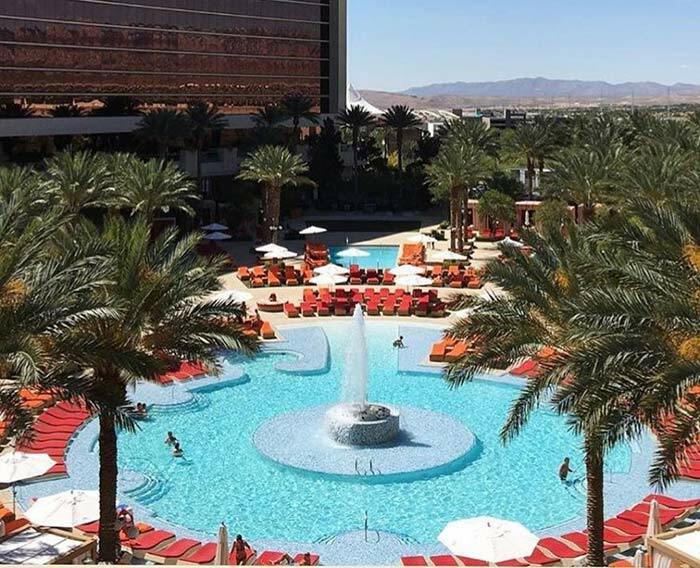 Red Rock Resort Pool – Photo Credit: Red Rock Instagram. The pool at the Red Rock Hotel is one of the most impressive in all of Vegas. It has a large circular pool in the middle, with many more smaller pools radiating out from it. Those pools are stunningly lit at night, while you’ll be able to see the titular red rocks in the background during the day. These pools cross a total of three acres, and offer 19 private cabanas, swim-up gaming to keep you and the kids entertained, and an incredible ‘waterfall island’. Those red rocks of course are actually the Red Rock Canyon, which is just 10 miles west of the strip and which provide one of the entry points to the grand canyon. The rocks look fantastic looming in the distance and give you the opportunity to drink in some stunning natural scenery while enjoying the incredible man-made pools. Mirage Pool Las Vegas – Photo Credit: Mirage Instagram. 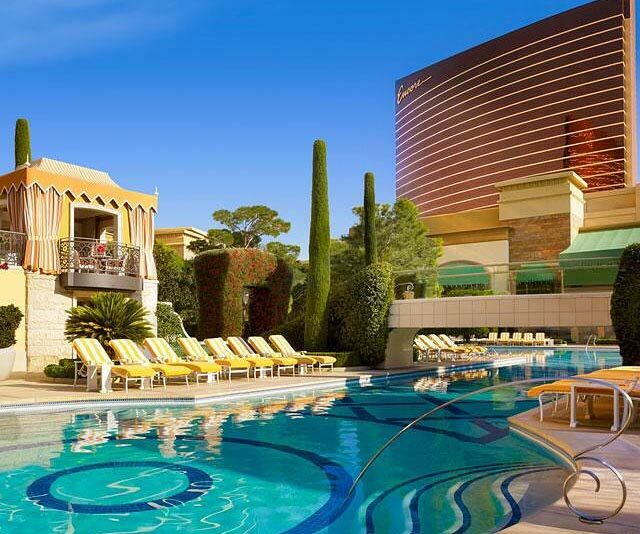 The Mirage Pool ticks a whole lot of boxes. For those looking to relax in the desert heat there are rows upon rows of deckchairs. Then there are the multiple stunning waterfalls for you to sit and chill under, or to play under. The pool itself is a massive, interconnected behemoth. And then again you have private cabanas, the perfect spot to sit and enjoy some calm with some friends out of the direct glare of the sun. Amenities include jacuzzis, showers, rafts for rent (! ), and more. 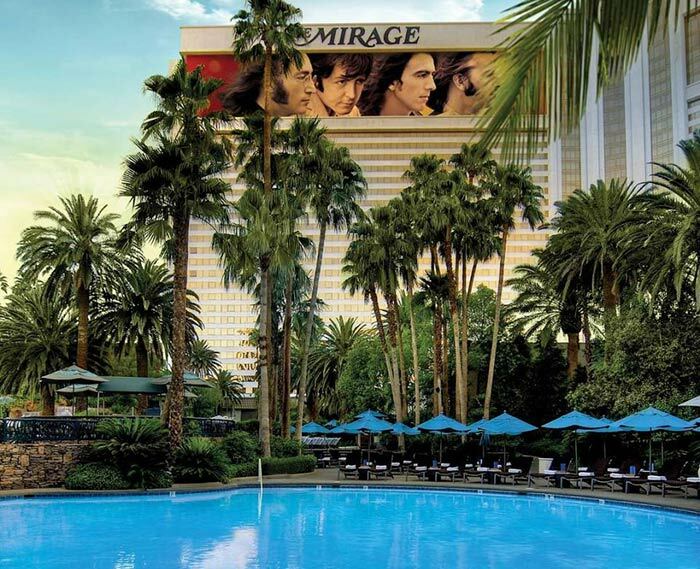 The Mirage pool is one of the most popular and top rated in the city. With a Polynesian tropical island feel and a quarter-mile shoreline this especially inviting setting is filled with lush foliage and waterfalls along with waterslides. The waterfall provides a nice respite from the sun and you’ll also find a series of interconnected lagoons as well as an adult “European-Style” pool with tops optional. This is another of the best known and most impressive pools in Vegas. It is another area with lots of huge, beautiful pools, and relaxing cabanas. You’ll be able to get excellent food and drink, and many locals use this as a great place to hang out with friends. Perhaps the most exciting part is the opportunity to watch films on select evenings on the big screen while you swim and relax. Where else other than Vegas? 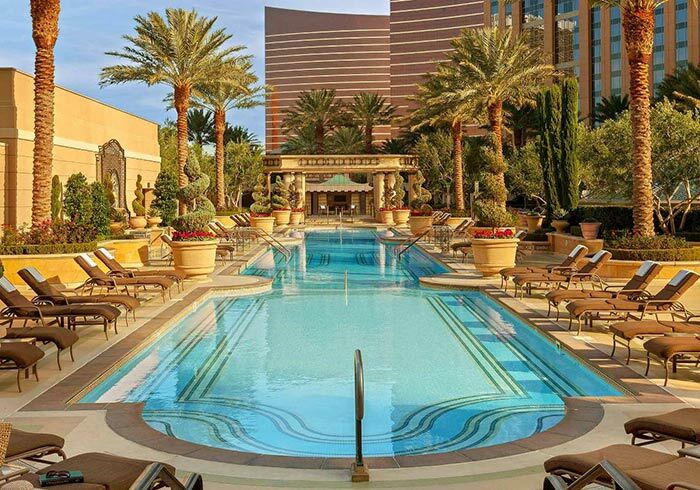 Palazzo Pool Deck – Photo Credit: Palazzo Instagram. If you’re looking for romance, you’ll find it at the Venetian with a romantic pool perfect for couples. Offering some of the best pools in Vegas, the Venetian’s five gorgeous pools will leave you feeling like you’ve been sunbathing in Venice. The main pool is surrounded by beautifully manicured gardens, ornate gazebos, and everything you could ever need for the ultimate in a luxury pool experience. The Venetian also offers a more secluded pool for those wishing to escape the hustle and bustle of the city and enjoy quiet relaxation. You get all the other features you’ve come to expect from Vegas pools – including cabanas, a ‘TAO beach’, the aquatic club for more private swimming, and a poolside spa if you feel like getting a massage. Another Vegas resort, another selection of gigantic pools with amazing amenities. And this time you really are getting spoiled with the sheer luxury. We’re talking mini fridges, plasma TVs, plush chairs, and more in the private cabanas. The pools themselves meanwhile are adult-only for those that are fed up of being splashed and screamed at in the overcrowded family resorts. 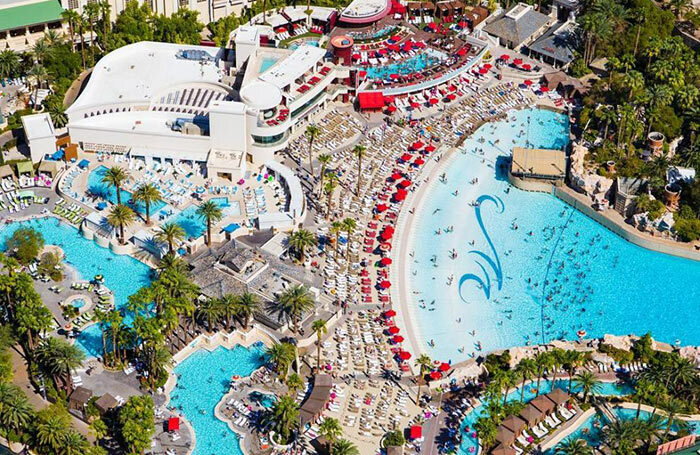 Mandalay Pool Complex and Wave Pool – Photo Credit: Mandalay Bay Instagram. The pool at Mandalay Bay is definitely one of the best pools in Vegas and considered one of the big draws for the hotel with an 11-acre sand beach (2,700 tons of real sand) in a gorgeous tropical location with rentable cabanas and day beds, personalized villas and more. Guests can throw their cares away floating along the lazy river underneath towering waterfalls, get a workout swimming in one of three pools or enjoy body surfing in the 1.6 million gallon wave pool with waves up to six feet high. For those that want to be entertained, the resort is often home to a number of touring live bands, which you can enjoy on the sandy beach area. Here you’ll feel like you’ve journeyed to another world, a slice of island paradise in the middle of the Nevada desert. 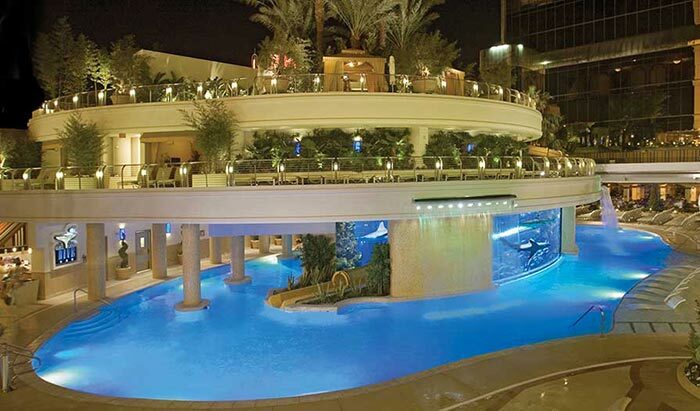 Gold Nugget Vegas Tank Pool – Photo Credit: Golden Nugget Website. The Golden Nugget’s pool is called ‘The Tank’, which has an awful lot of awesome going for it. How does a 200,000 gallon shark tank aquarium sound? Then there’s the three story complex, the 17 private cabanas, and the amazing waterslide that gives you the fastest route back down! All of this is built in and around the pool, which makes for some absolutely unique experiences. When you swim by the aquarium, you’ll feel as though you are swimming in amongst the sharks. And the slide too will take you in and through the aquarium, giving you the kind of adrenaline rush you normally only get in Hollywood movies. The H20 Bar gives you a place to grab a drink after, while the ‘hideout’ is the quiet spot for older guests looking to relax away from noisy kids. 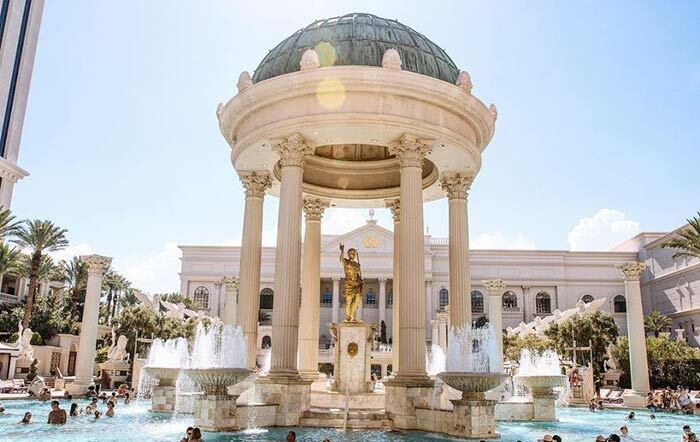 Caesars Garden of the Gods Pool – Photo Credit: Caesars Palace Instagram. Caesars Palace pool looks every bit as elegant and regal as you would expect it too. This is a brilliant place to come if you want to get beautiful Instagram shots emerging from the water. There are lots of fountains, and a wide selection of small pools spread out over a large area. The Garden of the Gods pool oasis at Caesars Palace includes six pools – choose your favorite. The Venus Pool is famed for its exclusive pool experience. Venus offers some of the most premium real estate as well as a secluded European-style retreat, 21 and up only. Flamingo Go Pool – Photo Credit: Flamingo Instagram. The Flamingo pool is just as pink as you would expect a pool called Flamingo to be! But that’s not the only draw. Swimming among the caves and the waterfalls is lots of fun for kids, while the huge parties that get thrown here regularly are the stuff of legends. The pool is gigantic with lots of shallow areas where you can relax and chat, and palm trees running down either side to create a relaxed vibe. Infinity pools are pools that have no visible sides. This is achieved by keeping the water level precisely at the same height, in order to create the illusion that the pool either stops dead in its tracks, or stretches endlessly into the horizon. The best infinity pool is probably the rooftop pool at the Downtown Grand Hotel. Others though include the infinity pools at the ARIA Resort and Casino, the Hard Rock Hotel and Casino, and the Encore. Lazy river pools are pools that let you float around a pre-defined lap and enjoy the view as you go. Normally this uses a raft or float of some kind, and it’s perfect for drinking in the sights while sitting back. Finally, the other exciting type of pool to visit is the wave pool. This pool is designed to mimic the natural tide and can be used for a spot of surfing – or just for a whole lot of fun. The waves tend to be larger than life, giving kids the opportunity to leap over them or swim through them. 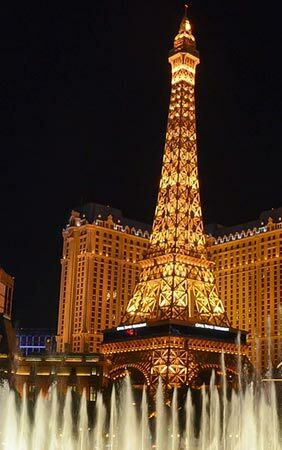 Of course, they don’t come bigger than the ones in Vegas! Some of the best include The Tank (as mentioned), the ‘Surf-A-Rama’ Wave Pool at Cowabunga Bay (ideal for surfing and set among a 1950s drive-in cinema), and the Mandalay Bay. If there is a pool you’d like to visit but you aren’t staying at the hotel, find someone to let you in. Chat it up with a group of people that are entering the pool and tell them you “forgot your room key” or that you’re staying at (insert hotel name) and wanted to “check this pool out”. Be friendly and most people will oblige. Just don’t let the hotels know you learned this trick from us! USE SUNSCREEN! It’s sunny all day, almost everyday in Las Vegas. So pack some sunscreen. We don’t want to see you end up with severe sun burns. Don’t be insecure about your body. Nobody cares what you look like. Seriously, no one cares! Going to the pool in Las Vegas is a way to relax and have fun. Don’t pee in the pool. Seriously, it’s not cool! Have a good time. This should be the most stress-free event of your trip. Spend time in the water, people watch, and forget about all your worries for a couple of hours. Any pools good for kids? Mandalay Bay, MGM Grand, Excalibur, The Mirage and The Flamingo are some of the hotels that feature family-friendly pools. These pools usually offer poolside lounging for the adults, as well as fun features to entertain the kids in Vegas. Waterfalls, lazy rivers and open swimming areas are a few of the features kids can look forward to. You will probably see the most kids at the Mandalay Bay and MGM Grand. Mandalay Bay offers a beach like wave pool as well as a lazy river like MGM Grand. As you can see then, there are a huge number of incredible pools around Vegas and these can offer the kinds of experiences, sights, and fun that would be the centerpiece of your holiday anywhere else! Where else can you swim with just a thin piece of glass between you and a shark? Where else can you enjoy such beautiful private cabanas? Or play a game of cards while relaxing at the bar? How about that rooftop infinity pool? So, if you or your family enjoy having a splash around, or want to swim among the sharks, make sure that you don’t forget to pencil in some time to spend down the pool and think carefully about which resort you want to stay in!